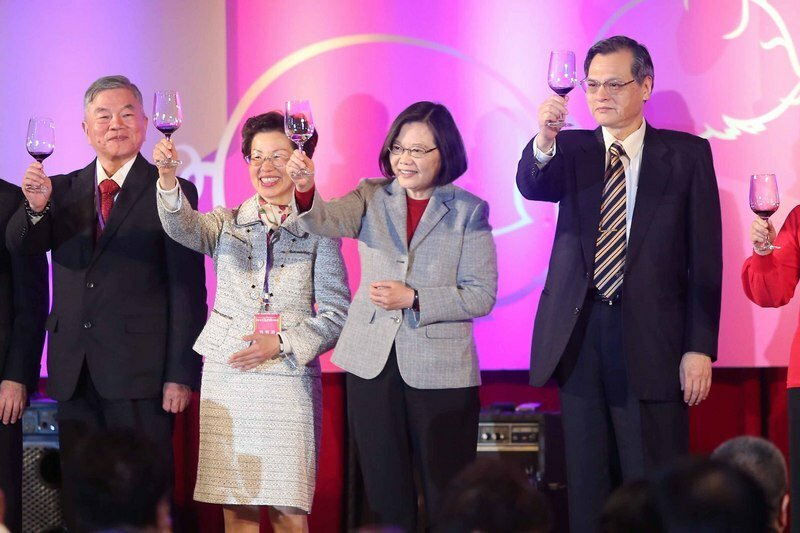 President Tsai (second from right), MAC Minister Chen Ming-tong (far right), SEF Chair Katherine Chang (second from left) and Economics Minister Shen Jong-chin (far left) attend Monday's event. President Tsai Ing-wen is calling on Taiwanese businesspeople based in China to invest back in Taiwan. She made the call on Monday at a special Lunar New Year event in Taipei. A lion dance kicks off the Year of the Pig. The Straits Exchange Foundation (SEF) is welcoming Taiwanese businesspeople based in China back home for the holidays. Top officials in charge of Taiwan’s China policies hold up a pineapple and a radish: symbols of good fortune. They’re here to show their support for Taiwanese businesspeople. SEF Chairwoman Katherine Chang thanks the 600 people who are attending the event, which she says is a high in recent years. Also on hand is President Tsai Ing-wen. She talks about her administration’s efforts to increase domestic demand and investment and create new drivers of economic growth. She says she hopes Taiwanese businesses can play a bigger role in the domestic economy. Tsai calls on them to return and invest in Taiwan, saying they can help change the trend of “Made by Taiwan companies” into “Made in Taiwan”. She says that’s the best way to respond to the US-China trade war and changes in the global economy. As to relations with China, the president says that as neighbors, it’s natural for the two sides of the strait to have exchanges and interact. But this interaction should not be limited by any political framework or preconditions. “Only when there is mutual respect and parity across the strait, can the two sides create a mutually beneficial win-win [situation],” she says. The president says that’s what the people of Taiwan are hoping for. She also says the two sides of the strait can have differences and should sit down together to talk about and resolve those differences. Tsai says that peace and the stability of cross-strait relations is a key issue in the Asia Pacific region. As a responsible member of the global community, she says, Taiwan will continue to strive to maintain peace and stability. But Tsai says this has never been the responsibility of just one party. She called on everyone in the region to do their part.